Michael “Mike” Daniel McNeely, 65, passed away June 27, 2015, in Grand Rapids, Ohio. Mike was born in Toledo, Ohio to Claude and Jean McNeely on February 10, 1950. He attended Maumee High School and graduated in 1968. Mike was very active in sports all of his life. He was a member of The Toledo Club and was an avid squash player. Mike received his associate’s degree in Business and Criminology from Owens College in 1970 and a bachelor’s degree in Business from the University of Phoenix in 2000. Mike started his business career as a salesman at Norwest Plumbing and Heating in the 1970s and worked along his father. Mike was made a manager at the young age of 21 and was the youngest manager ever at Norwest. After many successful years at Norwest, Mike and his father created a new company named North Star Plumbing and Supply in 1984 and successfully managed that company for over 15 years. Mike continued a successful career in sales and distribution where he created an independent company representing many high-end bathroom fixtures. Mike was recently awarded Salesman of the Year from California Faucet Company. Mike enjoyed sports, vacationing in Glen Arbor, Michigan, his craft beers and spending time with his family. 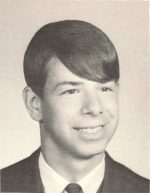 Mike was preceded in death by his sister, Deborah (McNeely) Tischinae of Toledo, Ohio. Mike is survived by his loving wife of 44 years, Gail; son, Jason (Sarah) of Atlanta, Georgia; daughter, Jennifer of Royal Oak, Michigan; grandsons, Jack and Max; his loyal companion, his dog, Ellie; his parents, Claude and Jean; his sister, Cindi (McNeely) Kuykendall (Carter); brothers, Pat and Jim McNeely.